I wrote about this game the other time yea? (Part I) For the main purpose of this post is about the golden eggs. So, I know many people are wondering about "what is the item that can prevent food spoilage? "~ and we all know that in reality, refrigerator is the only appliance that helps us to keep our food fresh. Therefore, of course, some of you might already have some clues about what is it when browsing through the shop item list. 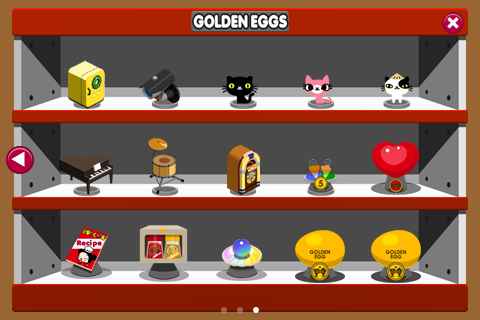 At the beginning when I started playing this game, I thought that all the hidden items can be bought using Gold coins since most of the unlocked items(such as piano, drums, Jukebox, cats, camera...) are sold in Gold coins instead of Garu points. But yea..., what-a-spoiler. (=.=) But however, I still be able to save up 40 Garu points by participating some contest held by Mobcrete. I've just won 20 Garu points not long ago by participating the "Add me thread" contest. So check their Facebook page and/or Twitter for upcoming events/contests because that's definitely an easy way to win Garu points! 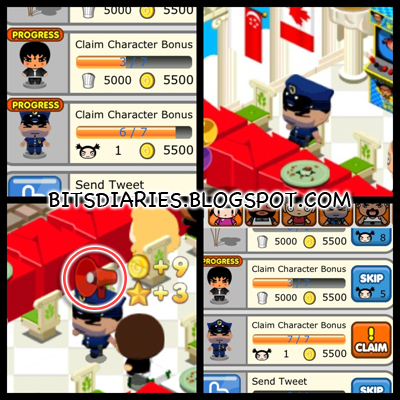 UPDATE on 27 October 2012 — How to claim character bonus? Look out for the "Megaphone" icon flashing above the character's head. Tap it to collect character bonus. - The icon only appears when he finished his meal and got up to leave. - Customer characters visit your restaurant once in while. - The icon appears every few minutes. Where can i find the hidden recipe? You have to tap every spots on the background. The recipes are randomly hidden in different spots for everyone. If you can't find it, don't give up. Quit the game and try it again later. - First register your chef name and restaurant name in the profile page(at the top left hand corner). - Friends, added in the Game Center, who already play Pucca's Restaurant will be added in the game as your neighbors automatically. Does anyone know how the task with friends thing works? It says you have to follow the Pucca Guide thing, which i did, but it only shows one thing everytime... o.o help please? if the Pucca's Guide icon is still there, it means that you haven't finished it. you have to follow all the steps. Can I help me? How do I get the golden egg from the "beach" and "soho" ? in order to unlock the golden egg for the "beach" and "soho", you have to first use the background(beach, soho) in your restaurant and then you have to find the hidden recipes by tapping every spots on the background. Is there any way I can add friends without Game Center? You can add friends via facebook. soho is very beautiful. i love it! how can i give gift to the other?? 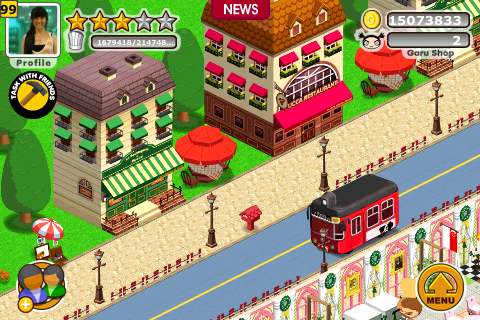 Hey mstwinkle how come when I added u and u accepted my add in game centre, I still can't see u as a neighbor? You have to visit your neighbor/friend’s restaurant and tap the red & white gift box at the center bottom of the screen to send gift. There’s slight delay on the neighbor page after friend request being accepted. Does anyone know how to change backgrounds? I looked on the menu but nothing. How do you get backgrounds? Your blog is very helpful. Thanks alot. I foynd out that oOnly the background cosy is for free :( and for some recipes, we have to pay in Garuda point. So disappointing as I don t have much garupoints. Please add me kamikazeee thank you. You can help your friends/neighbors with the task by sending them gifts. But you have to add them in Game Center first so they can become your friends/neighbors in the game. Thanks to you, I got some more info about this game. I love your write up here! I've played till level 30 odd BUT still very clueless HOW to connect with game centers' players. I can't seem to add/ send invitations under the icons at the bottom left corner. Any input from the expert here will be greatly appreciated ;) telia. thanks for stopping by~ :) Glad you enjoyed it. You have to login to Game Center and add friends via Game Center. Game center --- "Friend request's tab" or "Friends' tab"(either one) --- tap the '[+]' button on the top left corner --- enter Game Center ID and message --- tap "send". Please i don't have friends..
eg. Popcorn station .... Can we make popcorn and sell it? Nope, you can't make popcorn but you can collect gold coins from the task item. You don't have to buy them using garu point. Just complete the 'task with friends' and you will get the item for free. How do add any of you ? You can add friends via game center. How do I add someone`s ID as a friend? MsTwinkle u added me a few minutes ago, but i still cant see u in my list friends in Pucca.. I have already invite 5 friends, but the yellow egg is unlock. Pls help me! Hmm..., have they accepted your request? I can't go to certain neighbors and when I click on them my screen would say processing with Pucca on it then it goes all black and kicks me out of the game back to my original home screen.. Pls help!!! If it does not work for you then just heck care it? or just like what the 'Anonymous' said, you might want to mail the developers about this issue. I have tapped everywhere in the screen already.. lol..
how do you access different menus? like the noodles,soups,steaks etc? im so confused, i am up to level 14 and need help! You can get other menus by using different types of stoves. I have only got the appetisers menu completed . How do you get noodles and rice menus ??? Love this game!! Still new so i still couldn't figure out the whole thing!! 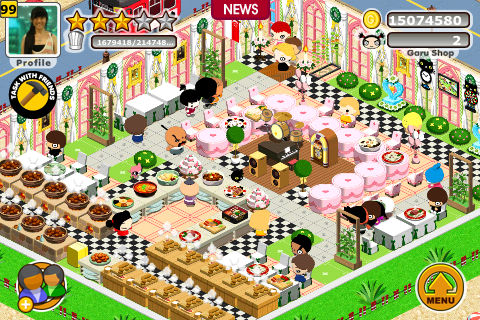 Can someone please give me tips on how to increase ur restaurant's rating!?!? Could you please add me, Ashley? I'm currently so frustrated though, people I have on gamecenter, I can't see them on the game LOL. So I've found the secret reciepe from the COZY background, what do I do now to get the SOHO background~do I have to use the secret recipe or something ? For other background, you have to purchase them using real money. I have found the recipe too, and it shows up in the golden egg area, but how do you activate a new background?? There is no "apply" under soho. I got the jukebox and piano, as well as the cozy background but they don't show up in the golden egg screen! why?? ".... The Golden Egg bug will also be fixed"
just want to ask.. mastering a dish means earning garu points??? hey, im on level 20 but still havent unlocked the chef position. wat should i do? I need friends lol and help can i have your gc name :)? I already bought the yellow fridge. The food doesnt spoil anymore but the yellow fridge still doesnt appear in the golden egg. Why is that so? if the yellow fridge still doesnt appear in the golden egg is because of a bug in the game version.. you need to upgrade you version up to 4.0...but not sure if the system will recognize the golden egg... 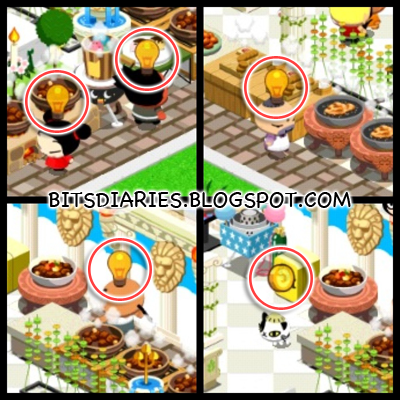 I had the same problem with the drums I had to upgrade, sold them and re-purchase them... not sure if you can do the same with the yellow fridge..
to add friends can some send me here the FaceBook IDs? so I can get the FB golden egg? Can I find those hidden items in somebody's background? Not mine? Please add me eveyone. :) "Fritz"
Woooow...what u wrote is really helpful...pls add me "L14S17"
There will be a “gift box” icon right above the “+friends/neighbors” icon. Tap that icon and you will be directed to the “gift list”. From there, you can accept all the gifts that your neighbors have sent you. If no “gift box” icon shows up then that means your neighbors did not send you any gifts. You have to pay real money for the background. The cost of each background is different. I paid US$0.99 each for the Soho, Halloween and Christmas and US$1.99 each for Beach, Greece and Valentines. a question about the claim character bonus: i'm at level 22 and the new task ask to claim character bonus from mio. do i need to buy mio in order to claim points from it or is it going to come to my store to give me points? My ID is BBHBAO, let's play together! By the way, how to earn gold star? could you please add me, id gevinatjie . thanks! Hi Ashley, your post is really interesting, thank you. how do i post a golden egg achievement on facebook from my pucca game? 1) Tap the “Achievement” icon (fourth icon in the menu). 2) Tap the arrow to navigate to the “golden eggs” page. 3) Select and tap the egg achievement that you want to post on Facebook. A small window will pop out. 4) Tap the Facebook icon to post the achievement on your Facebook page. I have a quick question. Does the little post it note and the character holding the red balloon with the number in the job board mean anything? Thanks. Hey ppl how to open our storage box? Where is it placed in? There’s slight delay on the neighbor page after friend request being accepted. However, if the problem still persists after 1-2 days, then probably there’s a bug. he says "a bad review from me could ruin your business forever!" i never see him ._. To claim the character bonus, tap the light bulb, gold coin and/or megaphone from whichever character you need for the task. How come I am not earning coins when I don't have the game open? This just happened the past two days. Does anyone know how to fix this? Thanks in advance! No. From reading the reviews, it looks like there a glitch in this version. We're just not earning coins unless we're in the game. Hope they fix it soon. Add me if I did not request you right! How do I send gifts without getting one first? I have only been able to return one to my friends after they left me one...how do I help others with their tasks? Got it!! Your page has been so helpful since we started playing. Thank you for sharing!! I can't find the hidden items!!!!!! Help me please!!!!!! WOW Ashley★ you're awesome! thank you so much.. you added the two I needed and more! good job! hey what's your GameCenter ID? so I can add you? I love this game!!! Pls add me as a friend. My game center ID is Zoey*23. Thanks! hidden secret how to acquire special item to prevent spoilage. Buy the "yellow fridge" from the shop to prevent food spoilage. Just want to ask if anyone knows of a bug in the game concerning facebook. When I try to go to the neighbor screen, the pucca's restaurant app starts trying to do something on facebook, but switches back and forth between the two apps. This goes on forever. I basically cant enter the neighbor screen now or do anything involving it. How can I find someone to add in gamecenter? For example, how can I add you to be my neighbor? Do I need to know thw persons game center id? Hi, every time i tap on the Pucca restaurant and the Garu restaurant for earn coins and garu points every five days, my game turn off, do you konw what is wrong abiut my game or is it the app? Anyone know what stove you use to cook Carnard l'Orange, Escargot, Foie Gras, Petit Dejeuner and Ratatouille?